Leonardo is celebrated as the Renaissance artist who created the masterpieces ‘The Last Supper’ (1495-97) and ‘The Mona Lisa’ (1503-06). Much of his time was spent in scientific enquiry, although most of his work remained unpublished and largely forgotten centuries after his death. The genius of his designs so far outstripped contemporary technology that they were rendered literally inconceivable. The range of his studies included astronomy, geography, palaeontology, geology, botany, zoölogy, hydrodynamics, optics, aerodynamics and anatomy. In the latter field he undertook a number of human dissections, largely on stolen corpses, to make detailed sketches of the body. He also dissected bears, cows, frogs, monkeys and birds to compare their anatomy with that of humans. 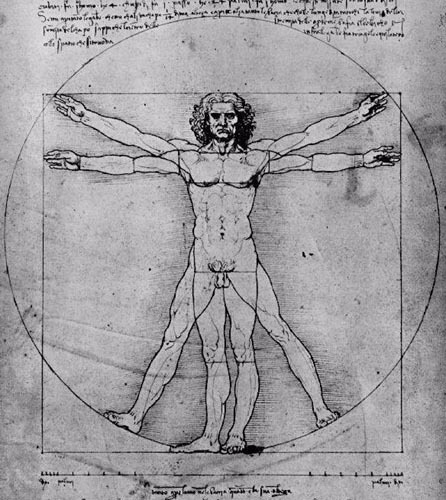 It is perhaps in his study of muscles where Leonardo’s blend of artistry and scientific analysis is best seen. In order to display the layers of the body, he developed the drawing technique of cross-sections and illustrated three-dimensional arrays of muscles and organs from different perspectives. Leonardo’s superlative skill in illustration and his obsession with accuracy made his anatomical drawings the finest the world had ever seen. 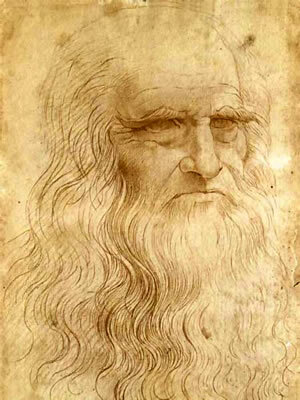 One of Leonardo’s special interests was the eye and he was fascinated by how the eye and brain worked together. He was probably the first anatomist to see how the optic nerve leaves the back of the eye and connects to the brain. He was probably the first, too, to realise how nerves link the brain to muscles. There had been no such idea in GALEN’s anatomy. Possibly the most important contribution Leonardo made to science was the method of his enquiry, introducing a rational, systematic approach to the study of nature after a thousand years of superstition. He would begin by setting himself straightforward scientific queries such as ‘how does a bird fly?’ He would observe his subject in its natural environment, make notes on its behaviour, then repeat the observation over and over to ensure accuracy, before making sketches and ultimately drawing conclusions. In many instances he would directly apply the results of his enquiries into nature to designs for inventions for human use. He wrote ‘Things of the mind left untested by the senses are useless’. This methodical approach to science marks a significant stepping-stone from the DARK AGES to the modern era. 1482 -1499 Leonardo’s work for Ludovico Siorza, the Duke of Milan, included designs for weaponry such as catapults and missiles. ‘Pictor et iggeniarius ducalis ( painter and engineer of the Duke )’. Work on architecture, military and hydraulic engineering, flying machines and anatomy. 1502 Returns to Florence to work for Pope Alexander VI’s son, Cesare Borgia, as his military engineer and architect. 1503 Begins to paint the ‘Mona Lisa’. 1505-07 Wrote about the flight of birds and filled his notebooks with ideas for flying machines, including a helicopter and a parachute. In drawing machines he was keen to show how individual components worked. 1508 Studies anatomy in Milan. 1509 Draws maps and geological surveys of Lombardy and Lake Isea. 1516 Journeys to France on invitation of Francis I. 1519 April 23 – Dies in Clos-Luce, near Amboise, France.